Get Victoria Taylor to personally send you his new posts. Holiday contests are some of the best ways to boost brand awareness, social media engagement, and sales. Not to mention how much people love the fun of winning. There’s no better time to host a contest than on an amazing holiday. Interested in running a St. Patrick’s Day Contest? This article will give you the 10 best St. Patricks Day Contest Ideas the capture the St. Patrick's Day spirit with ease! They’re perfect to use whether you’re planning ahead or late to the party. For every holiday there is a fun or tragic costume party waiting to happen. A lot of people go to the extreme dressing up and for St. Patrick’s Day. Some people even go as far as painting themselves green! Who’s the Greenest of Them All? Remember it isn’t just about dressing up. 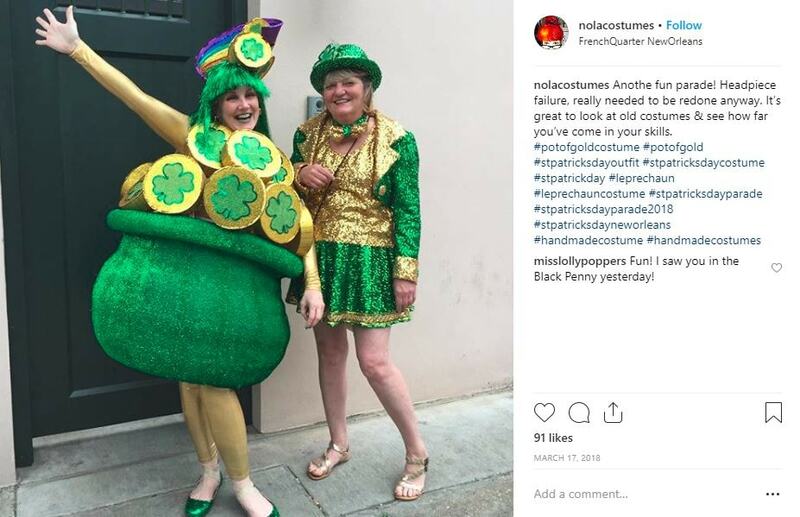 A costume contest can actually help people feel included by your brand so they want to connect and be a part of your brand’s community. There’s nothing more fun than seeing a cute dog or cat in Christmas sweater, turkey costume and yes, a St. Patricks hat and bow. Depending on your brand or niche hosting a pet contest might be your ideal choice. 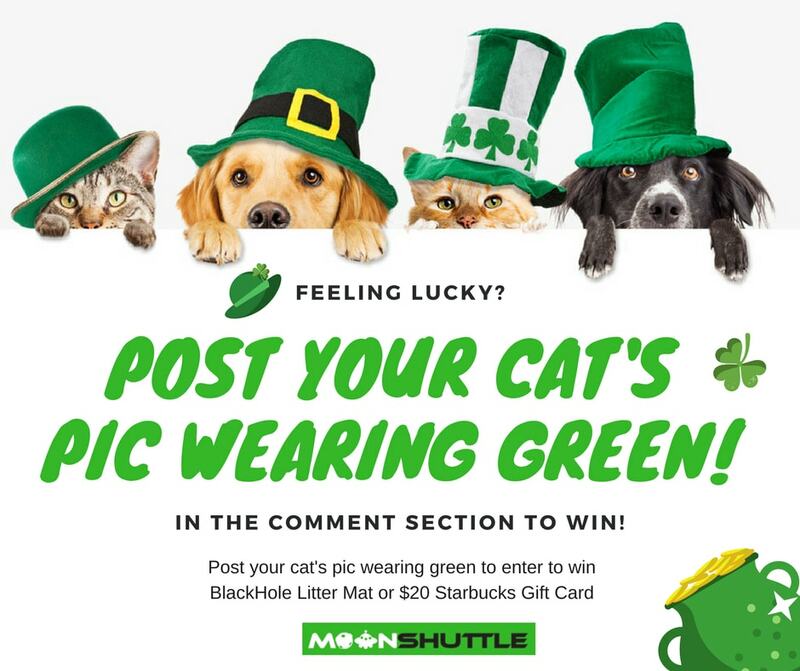 Ask persons to submit funny, cute and adorable images of their pets with St. Patrick Day costumes or themed props. 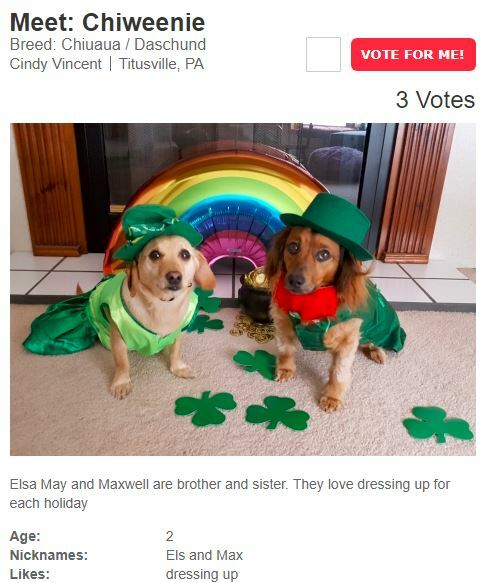 Modern Dog Magazine did this for their pet costume contest and the results helped boost follower and subscribers for their website. A Tag-to-Win Contest is easy to do and a great last-minute go-to for contest ideas. Randomly select a customer by either posting an image or statement on social media and ask followers to leave a comment or tag a friend(s) in your post for a chance to win. Bam! You’ve got yourself a winner. 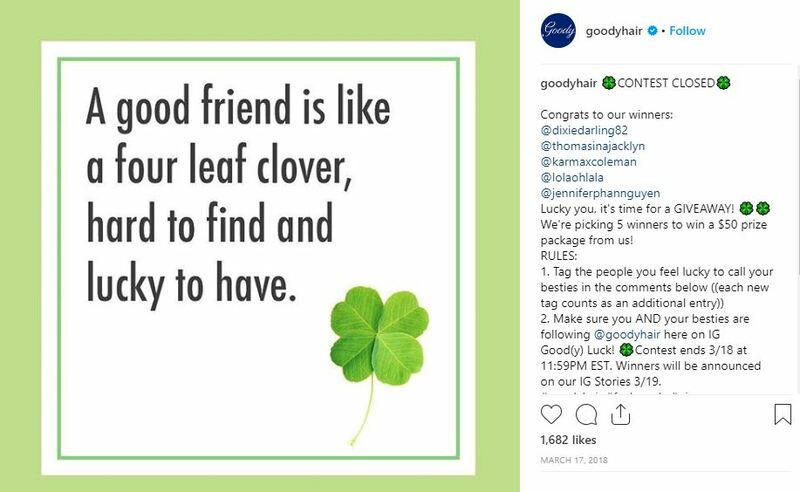 Check out Goody Hair's St. Patrick's Day contest for followers to win a $500 prize package filled with goodies by tagging your best friend. This contest takes less time when it comes to choosing the winner, based on how many winners you plan to select. Simply post an image on your social media page and ask followers to Like the post and then select a random winner from the total number of users that Liked the post. Another way of doing this to get even more brand exposure is asking followers to repost the image from social media page unto their own. The report with the most Likes wins. Let your followers show off their Irish cooking skills, or lack thereof, by hosting a St. Patricks Day Food Contest. Give people the chance to submit photos of their St. Patricks Day themed meals, treats or snacks. If you’re a food brand feel free to ask people to incorporate your product some of their St. Patrick's day food creations, or showcase your own St. Patricks Day meal to start off the contest. 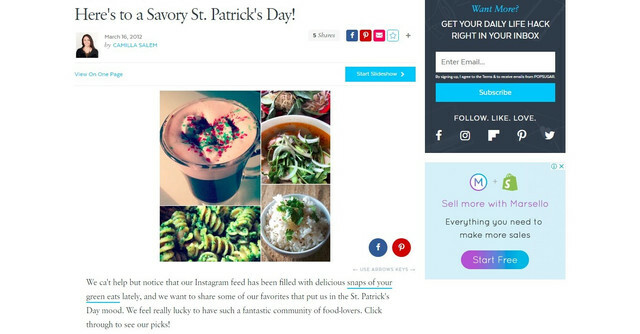 Popsugar did this perfectly by hosting a food contest on their Instagram then reposted the winning images on their website and social media platforms. Creating a contest by #Hashtag is a great way to boost your brand presence online. Your hashtag can be anything centered around something funny, socially aware or around your brand’s name. Hashtag contest are great for increasing brand awareness and can be a great way to increase your social media following. 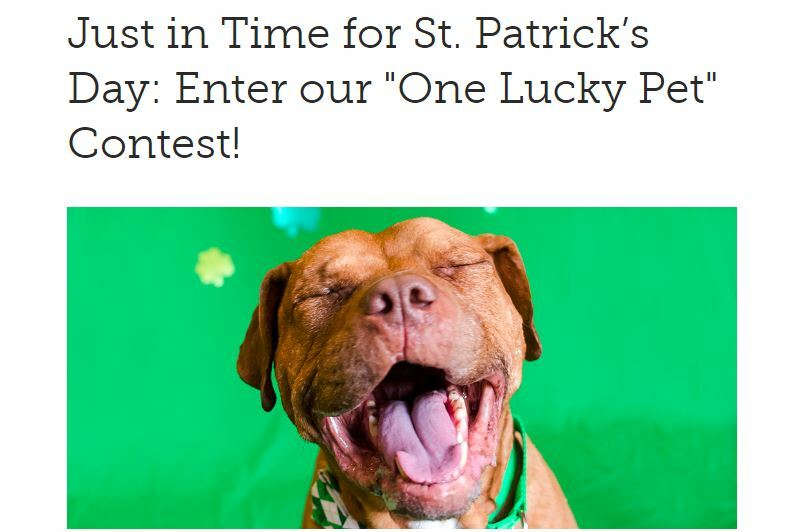 A fantastic example of a hashtag contest was The ASPCA St. Patrick’s Day Instagram contest called “One Lucky Pet”. The hashtag was so big ASPCA and other Instagram accounts like Cats of Instagram and Dogs of Instagram gained a massive following. Not only did they use the hashtag but brands who sold products for animals and created content around animals. Make someone feel “lucky” with a discount if they spend a certain amount on product from your online store. In your contest page, ensure to show exactly what people can buy or get with the discount. 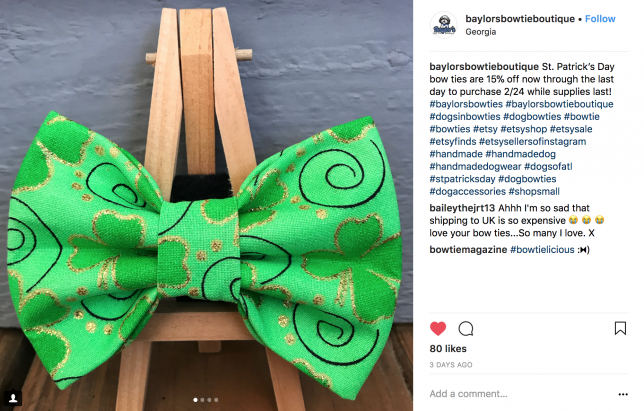 Baylor's Bowtie Bouqtie gave away a 15% discount on their St. Patrick’s Day Bowtie and with any other item purchased with. That’s one way to make the holiday special! Host a holiday sweepstake with a St. Patrick themed product to your fans and followers. If you don’t have St. Patrick Day products to give away based on your niche or service, you can offer up something just as good and let your entry requirements can be a holiday theme. 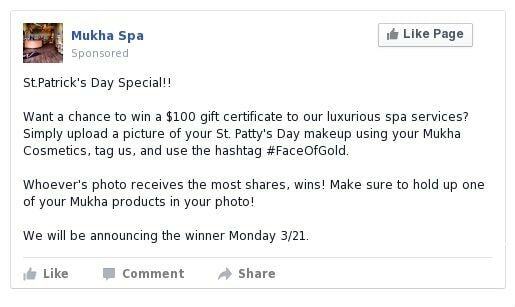 Look at how Mukha, a Luxury Spa that gave away a $100 Gift Certificate for the most liked St. Patty’s Day make-up with their cosmetic products. Brand collaborations are a great way to get attention, cut the marketing work in half and gain access to a wider audience, not to mention more sales. 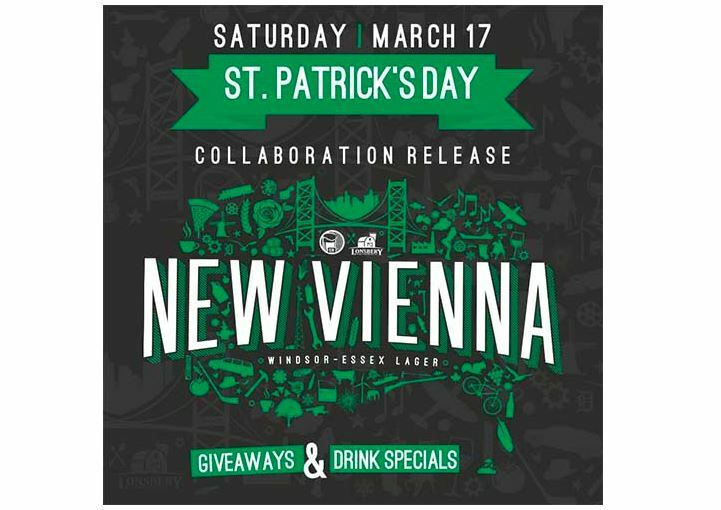 How about partnering up with a complimenting brand for St. Patrick’s Day? Take a look these two brand collaborations for St. Partick’s Day to get you inspired. 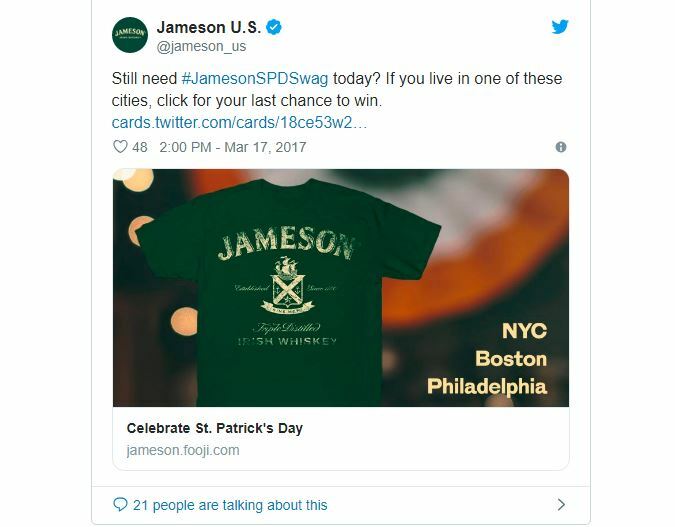 Jameson and Fooji, came together to create a giveaway for Jameson fans to tweet to win a free Jameson t-shirt for those in New York, Boston or Philadelphia. Fooji, an on-demand delivery app, would bring their shirts within two hours or less. Two different niches combined for one brilliant idea. They promoted a collaborated party to invite fans for giveaways and drinks specials to their fan and customers. If you’d like to do a collaboration and use a landing page along with social media is an excellent idea. Landing pages are, easy to manage and gives you major returns in ways you’d probably never expected. With Wishpond you can have your contest up in no time. Give persons the chance to win tickets for a “Night Out” or to a major event to enjoy their St. Patrick’s Day to the fullest. Just ensure that the tickets you giveaway are for events your audience will actually love. For example, Nashville Guru decided to give away tickets to The Last Stache -St. Pat's block party. This works because Nashville Guru is an events page for everything Nashville so it’s definitely something their audience would be interested to win for St. Patrick’s Day. I’ve also included a little something extra to help you really make the most out of St. Patrick’s Day for your brand. Hosting a contest is only half the work when your preparing for a big holiday like St. Patrick’s Day. So here are some pro-social media tips to prepare for St. Patricks Day. 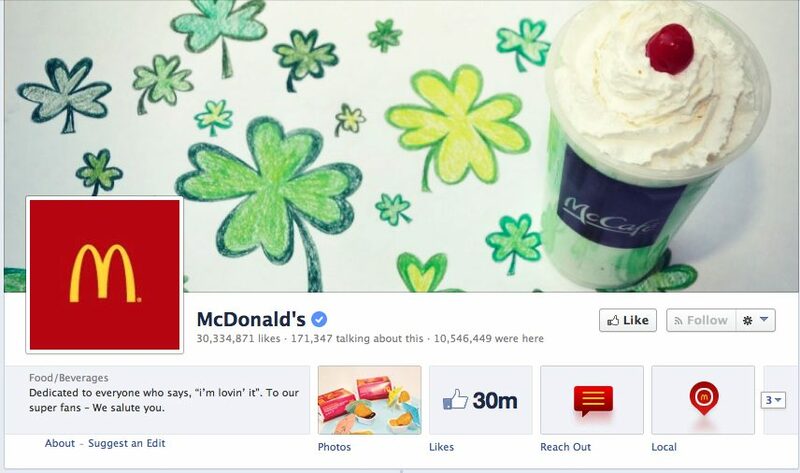 Let your social media pages have St. Patricks Day written all over it. Change your cover images, profile icons and start planning and posting St. Patrick’s Day content in your feed. You might not want to overdo it but just enough to let people know how excited you are about it. This gets people in the mood or frame of mind to expect holiday-themed content from you. If you plan on creating St. Patrick's Day content or contest, do it in advance so you can avoid the rush. 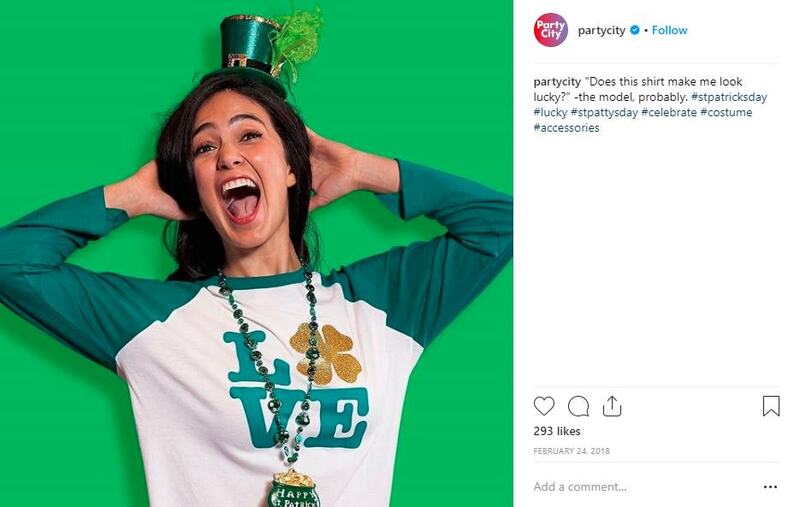 There are going to be a lot of brands it there posting St. Patrick’s Day images. 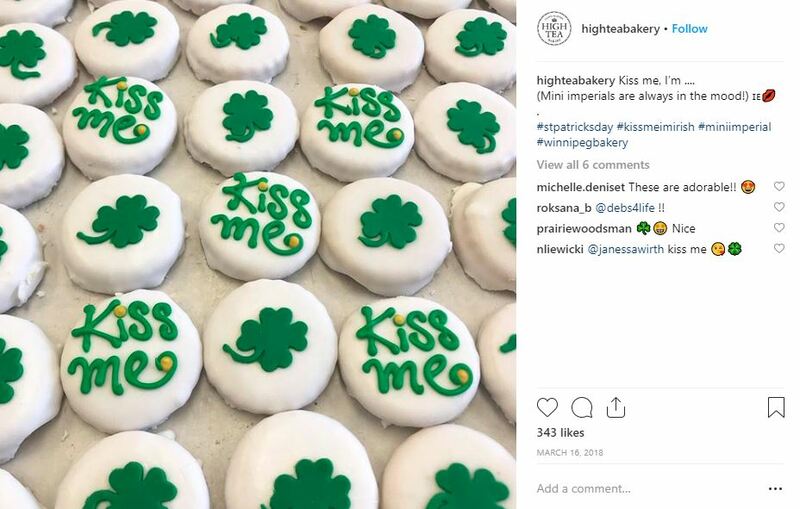 In order not to be mixed in with everyone else start posting St. Patrick’s Day images 2-3 weeks before March 17th should distinguish your brand or retailer as a leader, not a follower. 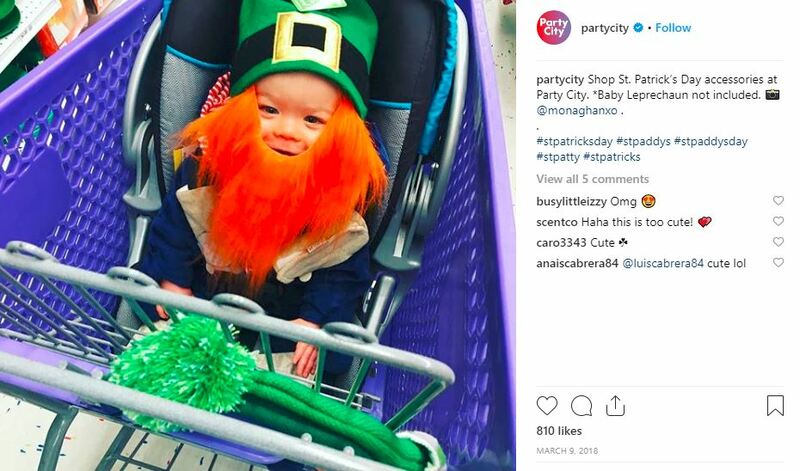 Take Party City, they start posting St. Patricks Day content from mid-February to March 17th. This is important especially if you're going to put your St. Patrick’s Day contest out there. If you need a bit more help you can take a look at Wishponds Complete Guide to Social Media Marketing for St. Patrick’s Day. Select best channels to post and advertise that work best for your brand. You can read endless blogs telling you where and when to post but ultimately you need to know where your audience will be. If you’re a brand that’s heavy on images, like High Tea bakery, then use Instagram, Facebook and Pinterest work best. If you're branded mostly word centred then Facebook, Twitter, and Google+ are your picks. If you're only using one social media platform free to use these 25 Creative Facebook Contest Ideas. Feel free to use all the social media platforms or just one, the choice is yours. The use of various social networks will help you become more in sync with St. Patrick’s Day. Hope you feel ready to take on St. Patrick’s Day. Which social media tip or contest idea was your favorite? Comment below and let me know. Victoria is a Marketing Generalist at Wishpond specializing in all things digital marketing and social media marketing. In love with blogging and Taco Tuesdays. Follow her on Twitter @vicknwsbest.